This dark golden colour speaks of its 16 year spell soaking up bourbon wood. The nose is sooty, oaky, briney and deep. This rich mouth is purely distinctive, leaving notes of peat, olive and crystallized orange. There is zero amounts of sugar in this cask which leaves a dry finish that is completely its own. Strong characteristics of a Islay single malt. Great suggestion for rum aficionados as this is unique. 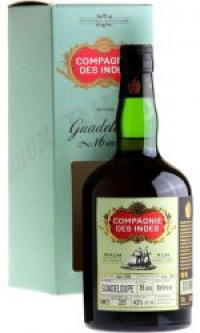 Compagnies Des Indes Guadeloupe is a single cask of Guadeloupe rum distilled by Bellvue. This is a rum not a Rhum agricole. Unlike Solera system rums which have dubious aging claims, CDI Guadeloupe has remained in one ex-Bourbon barrel for 16 years for its entire life.